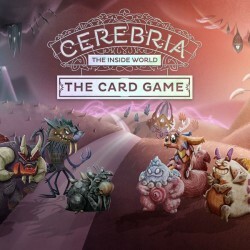 Cerebria - the Card Game is a quick, smart and accessible card game of set collection for 2-5 players, set in the same universe as Cerebria - The Board Game. Cerebria - the Card Game was created as a quick and easy-to-learn alternative (or introduction) to the main game. Although it targets a more casual audience, it has the deep and involved gameplay and high replayability that one would expect from a Mindclash game. 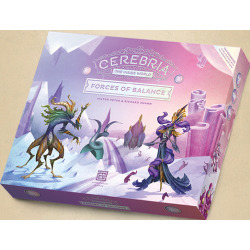 Forces of Balance, Cerebria’s zero-day expansion, extends the game to 5-6 players with a third side joining the struggle to shape Cerebria’s Identity. The Balance side introduces two new Spirits, Reason and Intuition (each with their own abilities and Spirit boards), and various new Emotion cards. On top of extending the maximum player count, the Balance side also encourages a new playstyle: their purpose is to create ties in the scoring objectives between Bliss and Gloom, ensuring Cerebria’s equilibrium. 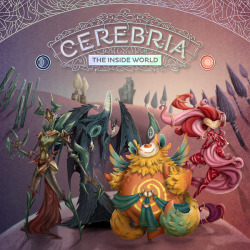 Cerebria is a deep, objective-driven area control game for 1-4 players, where Bliss and Gloom, the two sides of the human personality, compete to influence the Inside World’s developing Identity. Players play in teams, taking on the roles of Spirits of Bliss or Gloom. Using point-to-point movement and resource management, Spirits invoke and interact with Emotion cards to spread their influence, and control various areas and aspects of Cerebria.